1 Night Accommodation based on Superior Room. 1 Buffet at Wangi Melati Coffee House. 2-way Ferry Transfer from Tanah Merah Ferry Terminal to Nongsa Ferry Terminal inclusive all taxes and terminal fees. 2-way Land Transfer from Nongsa Ferry Terminal to Batam View Beach Resort. Any cancellation made on a confirmed booking, 72 hours prior to departure date or No-Show, full charges will be applied. FERRY: Collect boarding passes at least one hour prior to ferry departure at Batam Fast Counter (Tanah Merah Ferry Terminal, #01-13). 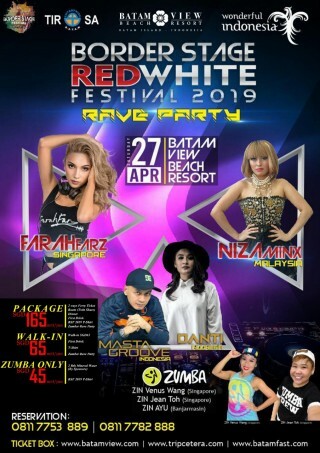 ROOM: Check in time 1400 hrs and Check out time 1200 hrs (Batam Time). Passengers are responsible to ensure that all travel documents and entry Visas requirement are in order prior to departure. Room rates are subject to change with or without prior notice. Promotion is not valid in conjunction of other promotions, privileges or vouchers.